When I went to see ‘War Horse’ recently, I thought of Uncle Jesse, famously a stunt rider in early films and trainer of horses for the Yorkshire Hussars. 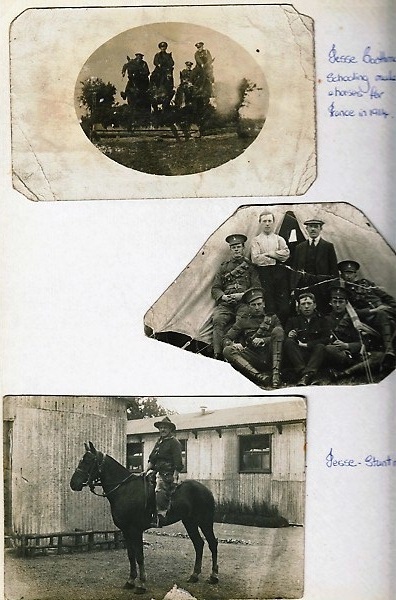 Last year, a fellow Boothman descendant had sent me some amazing photos of Great Uncle Jesse in WW1, training horses for the Front. The lovely Amanda Carter kindly wrote this guest piece for us and supplied these photos. If you haven’t been to see ‘War Horse’ yet – or read Michael Morpurgo’s brilliant novel – please do! Amanda descends from Jesse Boothman, and my great grandad was his brother, Tom. Both boys were sons of William Boothman, originally a farmer from Barnoldswick, who ended up farming at Roundhay, Leeds. Jesse took on quite a glamour, still being talked about decades later, on our side of the family. Although we lost contact, us descendants ended up by some fluke, living a village or two apart and Amanda and I even went to the same school, at one point although again, a year or two apart, so we never knew eachother. Incidentally, I don’t know if Amanda knows this, but one of my other great grandads, John Henry Thompson, raised hounds for the Bramham Hunt, in Ryther. This is a long way from Leeds where Jesse and Tom grew up. So a big coincidence. My Auntie Annie who died in her late 80s, had the stuffed head of a fox on her wall. She used to tell me the story of walking across our fields, one Sunday morning, wearing her best white dress ready for church, and seeing the hunt kill a fox right in front of her. They then ‘blooded’ her, and later presented her with its head. She was horrified – and still remembered it 80 odd years on, as the single most frightening moment of her life! She kept the head, though. Must admit, my mum’s side of the family did not agree with hunting but they needed the money, so raised the hounds for the extra income. Hope you enjoy Amanda’s piece as much as I did, and thanks again to Amanda! Jesse Boothman was born on a small farm in Roundhay, the youngest and smallest of 5 brothers. From the stories I have heard, none of the Boothman boys were short of charm, charisma and courage, Jess being no exception. 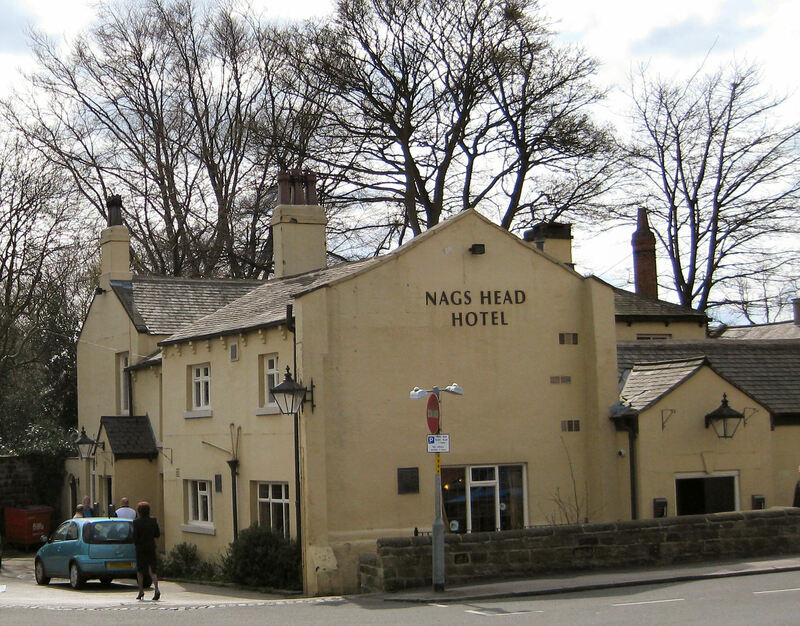 The Nag’s Head in Chapel Allerton. The pub had a more than interesting dark history involving highwaymen and body snatchers. One evening, after the odd pint no doubt, Jess and his brothers decided to investigate the cellar below for evidence of a secret passage. Carefully lifting the Yorkshire stone flags they discovered a small black door at one end with steps leading to yet another cellar below. At the church end of the cellar was another door, behind which lay a vaulted passage with a stone slab part way along upon which lay human remains probably left by body snatchers!. This tale was regaled over the bar of the Nag’s Head many a cold winter night! Jess married Violet Atkinson in January 1914; unfortunately, the dark days of WW1 were already looming on the horizon. Jess being very fond of the military (and the fact that you received free horse food) was already enlisted in the Yorkshire Hussar Territorials. When war broke out that summer Jess was called up and sent to camp within a week. His young wife Violet was left to manage the pub with their firstborn, Clifford, born in December 1914. Jess had many talents but none greater than his riding ability. He was a tough, roughrider, a trick rider and there wasn’t a horse alive that he could not stay on! He could split a lemon at full gallop with his sword, was champion tentpegger and was often used as stuntman for films. Lord Harewood was the Commanding Officer of the Yorkshire Hussars, he and Jess had known each other through the Bramham Moor Hunt which hunted regularly across the Harewood Estate as well as through the territorials. Lord Harewood was well aware of Jess’s amazing talent with horses and when Jess’s unit was sent to the Somme he wouldn’t allow Jess to go, instead sending him to Southampton to break in wild horses from the Argentinean prairies. Some of the horses were so wild and unbreakable they had to be shot. Jess and a small team of select men broke wild horses that had never been touched by human hand for the cavalry and to pull artillery. It must have been a heartbreaking task, knowing what they were to face. As men were killed on the front, Jess was again called to France twice more and twice more Lord Harewood pulled him back. So Jess returned from the war to the Nag’s Head, however, always willing to take a chance Jess was caught by the local Police for after hours drinking. The Police station was next door to the pub though the Methodist Church always had the finger pointed at them for reporting him! Still, life moved on well for Jess, he took a farm at Meanwood, where his second son Stanley was born and then moved to Spen Lane, eventually retiring to live his son Clifford at Holme Farm, Biggin where he rode to hounds at 80 yrs old on a thoroughbred stallion. Even as an old man he was lithe and fit and could still jump on and off a galloping horse. I knew it was going to be emotional – I was blubbing just watching the trailer! Brilliant film, though! Considering that I’m tearing up just reading about the mention of ‘War Horse’, never mind the Argentinian ponies (and how horrific was their journey over here? ), I’m really not going to see it. But a fascinating post, all the more for being places I know.